The AirFryer is Philips latest kitchen appliance which combines new technology and unique design components to provide a clean, healthy and convenient way of preparing delicious and tasty fried foods. It works by combining a grill and fast-circulating hot air to prepare foods that you would normally need to deep fry to get the same results. Most importantly, the AirFryer does this without the need for extra oil so you can effectively make chips and other snacks with up to 80% less fat than conventional frying. Included with the AirFryer is a glossy little cookbook with 30 different recipes for you to try, some of which include meatballs, potato rosti, quiche, chicken wings and even some gorgeous looking chocolate brownies – you’ve got to love that. It also comes with a Quick Start Guide which details the cooking times and temperatures to use with all types of food – from thick frozen fries to fish fingers to steak and chicken, yum! 1. SUPER QUICK – no more waiting 25-30 minutes for frozen fries to cook in the oven – they take just 12 minutes in this baby. 2. 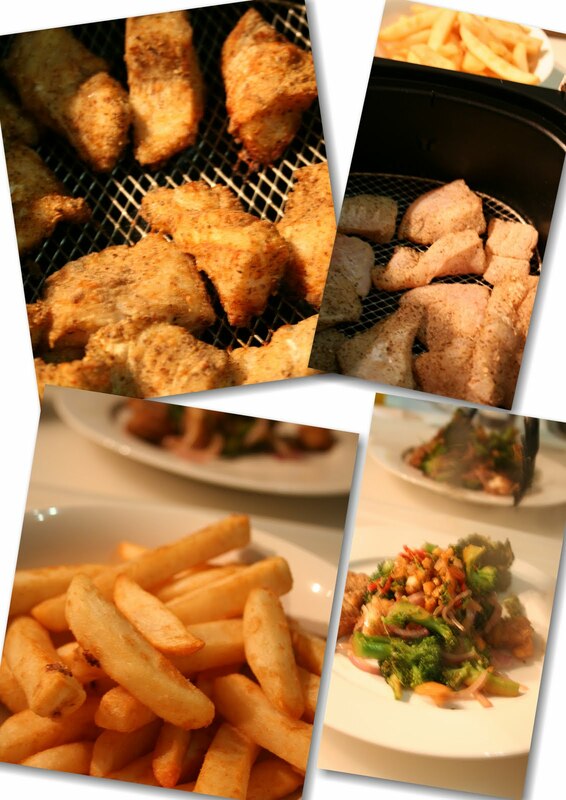 NO ‘DEEP FRYER’ OIL – forget the expense of having to use litres of oil to deep fry your food. Cooking with oil in a deep fryer is a nasty experience, not only do you have to dance around avoiding oil spatters and burns, but your kitchen and house fill with the smell of it and then you have to find a safe way to dispose of the oil, yuk! In this regard the Philips AirFryer comes to the rescue by providing an easy and environmentally safe way to cook tasty ‘fried’ food. Best of all its HEALTHY! You won’t ever have to feel guilty again for enjoying your favourite fried foods. < EASY TO USE - Throw in your food, set the temperature and the time – then walk away! Simple. DISHWASHER SAFE -Does the word ‘Dishwasher’ mean anything to you? If you are like me, it means EVERYTHING when it comes to cooking. Simply remove the fry basket and the pan and pop them into the dishwasher and you are ready to go again. Nice! DESIGN – I just love, its modern, funky and compact and looks great on our kitchen bench. I really love the retractable cord storage feature which means that you don’t have to contend with a long annoying cord. SAFETY – Avoid oil spatters and burns from hot oil which is used in traditional deep fryers and this is particularly important for families with children. I guess the most important test which I hear you all asking about involves the much loved hot chip. I am happy to report that the AirFryer exceeded my expectations with this one. Firstly, I tried regular potatoes; I just cut them up, coated them in ½ tbsp. of oil and some chilli powder and threw them in. Approximately 18 minutes later they were done! Super easy and very tasty and they had a slight crisp to them – similar to homemade oven chips but in less than half the time. Those of you who watch Masterchef would remember George’s Masterclass on making the best hot chip – well for my second test I tried this method. I pre-boiled some potato chips then dried them with paper towel and placed them in the fridge, I then coated them in oil and in they went. This resulted in a much crunchier chip and they were gone in seconds. The most impressive chip test came from the frozen variety which I bought from the supermarket. Now we have all seen the frozen chips they use in chicken shops that result in that delicious, golden crunchy delight we all love, mind you they are cooked in a sea of oil. Well, I am pleased to say that the frozen kind I tried were in fact better than the one you could buy at your local chicken shop and guess what – I didn’t have to dunk them in oil to achieve this result. In case you would like to replicate this result in your Philips AirFryer, we used crunchy beer battered steak fries, they were delish! 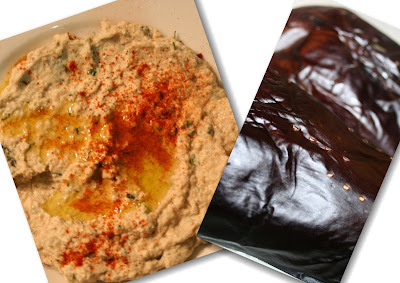 I absolutely love eggplant and this tasty Lebanese dip is one of my favourite foods. Despite this, I have never made it before, until now! I have never made it before because to be honest, I really couldn’t be bothered having to fire up the barbeque just to char some eggplant, not to mention having to clean it afterwards. So when I noticed a recipe for red pepper dipping sauce in the AirFryer cookbook, it got me thinking.Could my dream of easy to make Baba Ghanoush be closer than I thought? Yes, yes it was. Using Abla Amad’s recipe for ‘Baba ghannooj’ the Philips AirFryer has helped bring a whole heap of freshly made Baba Ghanoush into our kitchen, it’s great for entertaining. After purchasing some organic free range chicken wings I marinated them in garlic, ginger, soy, kecap manis, sesame seeds,chilli, a few drops of sesame oil and some Clayridge honey which I bought recently. 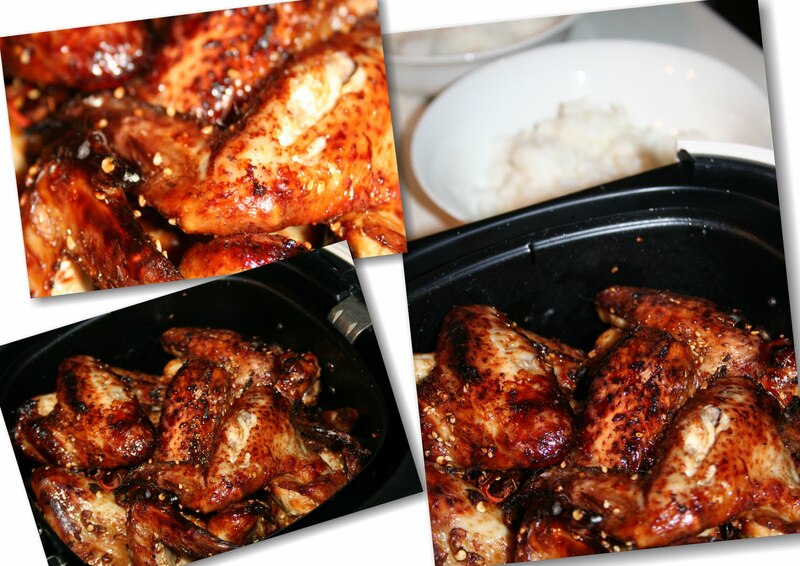 I then used the AirFryer and voila! Super tasty and crispy chicken wings and the meat was kept really moist which we all loved. I also noticed that the pan in the AirFryer had collected quite a bit of the fat that had come out of the chicken wings as they were cooking, love it! If you love polenta like we do then you should try this recipe for Italian Meatballs in Tomato Sauce by celebrity contestant Indira Naidoo from Celebrity Masterchef (2009). 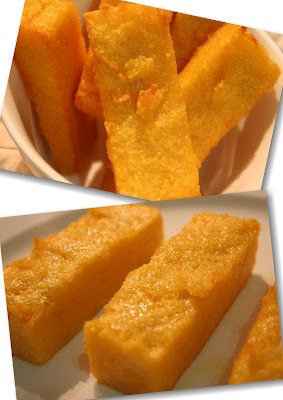 It has become one of our favourite recipes but pan frying the polenta batons have always been hard – they always break up or don’t brown evenly and we end up using copious amounts of oil – erk! Thanks to the Philips AirFryer we can now prepare the ultimate polenta baton – they are just peefect! We still use oil by just painting it on each baton using a pastry brush and this results in crunchy golden polenta batons, wow! I can honestly attest that our polenta batons are now amazing. We recently took the AirFryer over to my Nan’s place for our monthly family dinner and Pete and I cooked this recipe with the polenta batons and everyone was really impressed. The dining room was filled with crunch! Pete bought some fish home one night and after coating it in spices which included coriander and mustard seed, cumin, pepper and some crushed cashews he was going to pan fry it. I suggested we try it in the AirFryer instead. We sprayed it lightly with olive oil spray and it turned out really well. It was golden on the outside, didn’t fall apart and was still really moist. We served it with a few chips (of course!) which were also done in the AirFryer and a few vegetables. I’m still working on different foods that I can prepare in the AirFryer, so stay tuned for new delicious recipes. You all know I love to bake so I am planning to test a whole range of baked goods soon. We’re heading off on holidays later today and when we return look out AirFryer -- a sweet assault is on the way. The Philips AirFryer was released in April this year and retails for about $329. You can find it available for purchase at leading electrical and department stores. 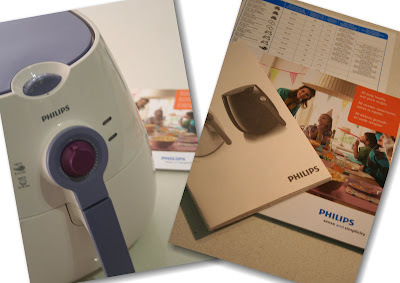 The Food Mentalist sampled the Philips AirFryer thanks to Phillips and Fleishman-Hillard. Oh my goodness! I'm really starting to love this product! Baba ganoush in minutes - that's great. I wonder what other gorgeous recipes are in the cookbook... It'd be great to try a few of them! wow, you've been busy with this. you chips look a lot better than mine did. THis is the second review I've seen of this and it looks really good once again, I will have to put it on my wish list as i always avoid cooking anything that uses copious amounts of oil. I have looked at this fryer about 10 times and every time I look at the price and wonder if it's just going to end up being used as a doorstop. It's a great little machine huh?! 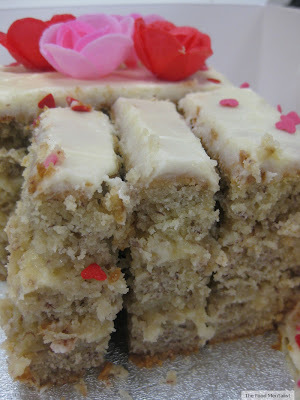 We got together last weekend using Ironchefshellie's one- we made chocolate spring rolls! :) We tried bounty, butterfingers and boost- so good! Thanks for your post! I am trialing one out too and I'm really interested in how it works! I read your review of the Air Fryer and tried out my daughters air fryer tonight whilst housesitting at her house, and cooked fabulous fries and spicy chicken wings.. superb!.... You made it sound so easy so i thought i would give it a go !! Was thinking of buying one, but wasn't sure if it was worth it. But now that I know it makes more than just chips, I think I shall! Thanks. I got myself one and will be drying out some chicken wings tonight! Thx everyone :) Daniel try cutting your wings in two pieces and then coat in flour, oregano, chilli powder and turmeric then lightly spray with oil spray or brush with oil. Set AF to 200' and cook for 20 minutes - perfect Kentucky fried chicken like wings - amazing!!!! Low fat and crispy, yum! If I had room in my kitchen I would buy one of these in a flash. I love the thought of crispy-fried chips without the oil. I love honey king prawns. Can I cook them in this with the batter? I've had my air fryer for a year now and love it! Threw away my deep fat fryer. No more mess and the food is delicious. I've made chicken wings, fries, chicken nuggets, fried fish, etc. With non-stick material, air fryer is out of grease and food particles which makes my cleaning effortless. I love it. I do not need to flip the food so I can go out for other chores for a while during the cook. My most frequent dishes with air fryer are chips and chicken wings. No try with fish yet but it looks pretty shining exterior and juicy interior with yours. Oh, I like chips but don't dare to eat much because of my high calories. Since I know air frying technology I'm free to eat any kinds of fried food without worrying about the fat and grease. Bravo, air fryer! It’s a very useful post. thanks for the efforts. I own a Philips AirFryer and use it often to enjoy French Fries, Fried Plantains, Chicken Wings, Chicken Fried Steak, Homemade Sweet Potato Tater Tots, you name it! IT'S AMAZING! Everybody should have one! Just saying. I share an recipe cooking, do you want try it. Good luck to you with Vegan Stuffed Capsicum. I love cooking, I love eating foods no oils and also know some Iocal food. These peppers sound fantastic and I’m intrigued by the airfryer. Philips is a good brand! I've used some of their products to make my diners and they are just perfect! 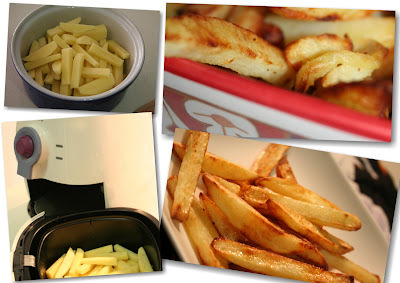 I always love the way air fryer can help me in my cooking, especially for any kinds of fried food.My french fries is one of the best dish which I can make. I often use 1/2 tablespoon of olive oil for chips but for others such as vegetables or chicken wings I will not add any extra oil. Great review, instructions and visuals. Philips Airfryer is a great airfryer. Love the Chips,BABA GHANOUSH and the Chicken Wings. These like so yummy. Thank You for sharing this post. Philips AirFryer is my favorite AirFryer. Thank you ones again. Hi!, I was looking into buying a new airfryer and your blog post is just exactly what I was looking for. This philips airfryer really fits my needs. Thank you so much.